Uglyworld #189 - Spooky Teeth Brushing, originally uploaded by www.bazpics.com. Wage was up early this morning in Leuven, Belgium as he knew we had to have an early breakfast and then get into the car and drive all the way to Marburg in Germany to do some work - he was even up before me, he said he was excited to see Marburg for the first time and kept waking up throughout the night. He decided to shower and brush his teeth in the dark so as not to wake me up. 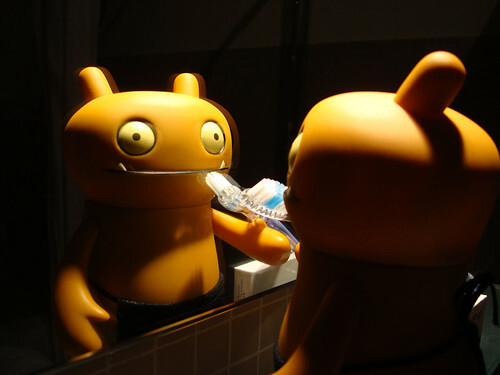 While brushing his teeth he realised the mirror in the bathroom gave a weird kind of double image when you looked at it from an angle and set the camera up to take a picture of him brushing his teeth in front of it.